Taxis, especially those of foreign lands, are jammed together in a corner of my mind that I would rather keep shut. I don’t like to be in the back of a stranger’s car, city blind and barriered in by language, especially when the price to pay goes up with every sweaty minute. However … late September en route to Rome we decided, despite all my worst fears, that a taxi was the best option. So, with dread in every suitcase-dragging step, we walked out of Fiumicino Airport into the night and tried not to look inglesi. I don’t think the act got us further than the customs but we stuck with it until one taxi swung open its doors and sucked us in, thankfully with the price to the city centre plastered all over its paintwork. Our mix of hand gestures, English, Spanish and Italian soon sorted us into the heap marked ‘first-timers’, and it perched the driver on the pedestal marked beaming, humorous tour-guide. We liked him we thought, and settled down to focus on our lingua-confused new history of Rome. The stream of traffic headed into the city. First there were motorways, which shrank to roads through Mussolini’s Rome before they flung wide again on the grand piazzas. Tourists were everywhere but they only added to the scale of the monuments labelled beneath the street lights by our driver. Then the city tightened around the historic centre and we tangled to a virtual standstill. The uneven rhythm of the cobbles patterned beneath us as apartment blocks filed into corridors and our driver, a seventh-generation Roman, edged us down tight one-way streets with parked cars glued the length of the walls. His final move had to be a left-angled turn between two high-walled buildings barnacled with vehicles. The car slowed to a whisper. The turn – difficult for a shopping trolley, impossible for an estate car – did not bother our driver. Body language unstressed he reversed briefly then swung the bonnet down the tiny street. We sucked in our stomachs and clumped tight to the middle as we slid like water over glass alongside the parked cars, then bent around the corner of the wall … unscratched. We had arrived … and the delivery was worth every cent. 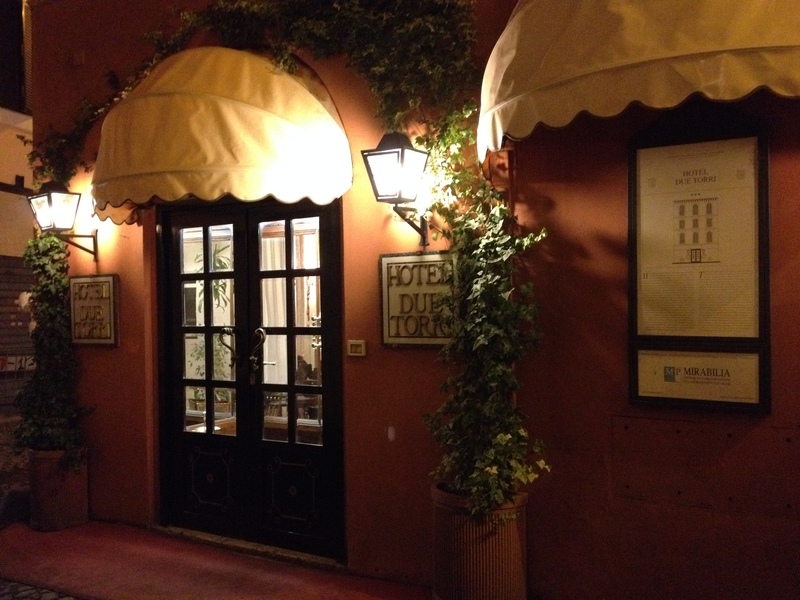 Our destination – the small, 26 room, Hotel Due Torri – an old, elegant residence used in the past by cardinals and bishops. Our room wasn’t big but it was comfortable, and, surprise of all surprises, it was really quiet even though we were squidged up the tiny arteries near the heart of old Rome. The staff, like our driver, were genuinely friendly and endlessly patient with their knowledge. They also spoke excellent English (unlike our driver) and one could even boast a ninth-generation Roman pedigree. We could not have had better welcomes to Rome. Two days later, well-walked and well-rested, we waited hopefully at the hotel for a taxi to the train station. It never came but its driver did – with apologies. His car was two hundred yards away and he would not bring it any closer. 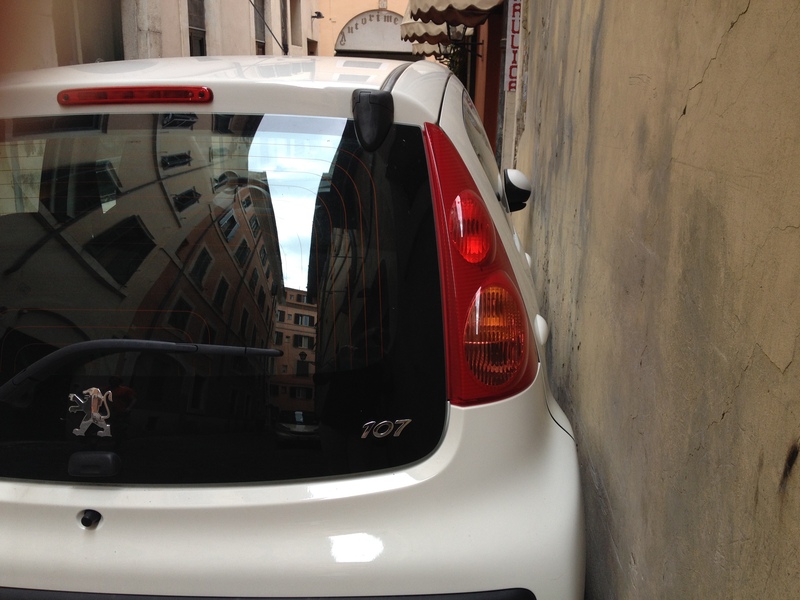 This entry was posted in Italy, Rome and tagged Hotel Due Torri, Mussolini's Rome, parked cars, Rome, taxi. Bookmark the permalink. Makes me want to go…. just for the ride! Come on Aggie! Far better to be here than reading about here … we’re waiting! I love this story, Georgie! Your writing draws me straight into Rome and I am there, holding my breath with you. More please!